On January 10, 2018, Sarah Rothenberg’s A Proust Sonata will have its New York premiere in a co-presentation with French Institute Alliance Française (FIAF). Performances are Wednesday, January 10 through Friday, January 12 at 7:30 PM at FIAF’s Florence Gould Hall, 55 East 59th Street. Tickets go on sale November 1 at fiaf.org. The New York cast includes Henry Stram as the Narrator; Nancy Hume as Celeste/Francoise; tenor Nicholas Phan; violinist Boson Mo and pianist Sarah Rothenberg. A Proust Sonata will also be presented at Rice University’s Moody Center for the Arts on Thursday, November 16; Friday, November 17, and Saturday, November 18 at 8:00 pm, in the Lois Chiles Studio Theater. The performances are in conjunction with Sarah Rothenberg’s interdisciplinary course at the Moody Center, Making Music with the Media of the Stage: A Proust Sonata. The Houston performances feature Carlos Dengler as the Narrator, Nancy Hume as Celeste/Francoise, pianist Sarah Rothenberg and students from the Shepherd School of Music. For tickets, go to moody.rice.edu. 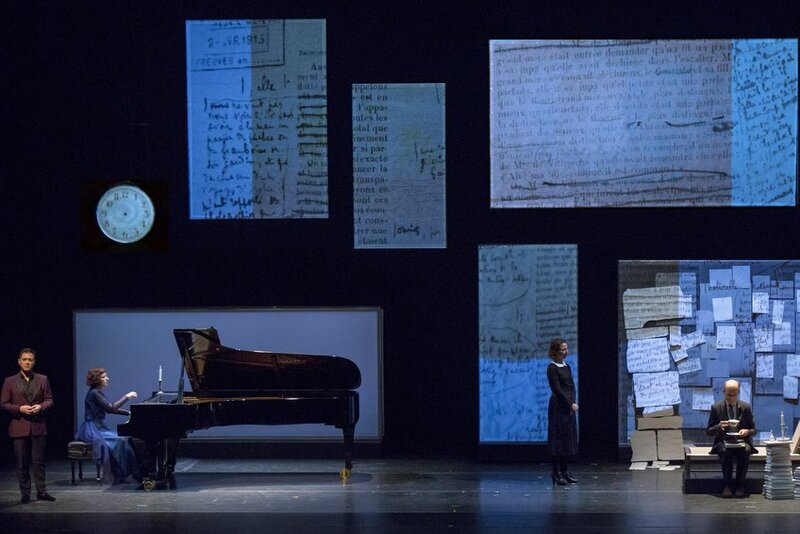 The production is inspired by Proust’s early 20th century masterpiece In Search of Lost Time and interweaves text, music, and image into an innovative multi-media performance. Pianist Sarah Rothenberg is joined by a Tony Award-winning design team and a cast that includes professional actors and musicians together with students from Rice’s Shepherd School of Music. The music of Fauré, Shumann, Debussy, Chopin, Ravel, Beethoven, and Reynaldo Hahn evoke the author’s themes of memory, lost childhood, fashionable Parisian salons, and the final reclusive years when he withdrew from society to complete his magnum opus.